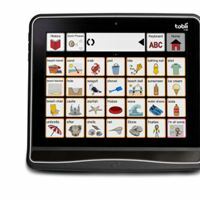 Today, Tobii Technology, the global market leader in eye-tracking and Gaze Interaction assistive technology, announced its next-generation augmentative and alternative communication (AAC) products – the Tobii I-Series. The Tobii I-Series, a family of eye-controlled communication devices, provides individually optimized communication solutions for people with communication conditions such as Lou Gehrig’s disease (ALS), autism, Rett syndrome, cerebral palsy and muscular dystrophy. Today’s announcement introduces two new purpose-built speech-generating devices (SGD) – the I-12 and I-15 – which will begin shipping next month. The I-12 emphasizes portability with a 12-inch capacitive touch screen, while the I-15 features a 15-inch capacitive touch screen and is ideal for users who require more screen estate to display detailed computer applications. The I-Series harnesses the speed, power and accuracy of Gaze Interaction – Tobii’s unparalleled acute measurement of eye gaze – to provide freedom of expression and greater independence for users with communication difficulties. With the I-Series, users can engage in daily communication through speech, email, text messaging, social networking and phone calls. Users can also take and share high-quality photos, surf the Web, play games, access computer applications, and control their environment and other connected devices. Wake-on-Gaze™ and Sleep-on-Gaze™: These new eye-tracking features, unlike anything available on the market today – AAC or otherwise – allow users to put I-Series devices to sleep or wake them up simply by gazing at “hot spots.” The ease of putting the devices to sleep during periods of inactivity significantly prolongs battery life and enhances accessibility. Longer battery life: I-Series batteries last nine hours with constant use. New features, including Wake-on-Gaze, also allow users to manage power and lend to significantly longer use periods, while hot-swappable batteries also enable batteries to be changed without disrupting usage or losing data. Rugged durability: I-Series devices are built to last, with a solid-state hard drive that facilitates fast startup and withstands impact and IP43 classification for proven resistance to moisture and particles larger than 1 mm. The I-Series also features a damage-resistant, capacitive touch screen made from Gorilla Glass™ – a first for any AAC device. Social connectivity: Tobii Gaze Interaction with zoom and premade Tobii Communicator pagesets allows users to easily use Skype, Facebook and other social media applications with near-pixel precision. Improved environmental controls: Operate infrared-enabled controls directly through Tobii I-Series devices to manage lights, air conditioning, doors, telephones, TVs, DVD players, stereos, toys and more. Versatile mounting: Unique wedge design and auto screen rotation let users stand devices upright without having to mount the device for Gaze Interaction or lie it down for touch interaction. Dual cameras: Tobii I-Series devices have forward- and rear-facing cameras. Forward cameras feature an autofocus function to enable users to take crisp, clear photos. The Tobii eye-tracking advantage: Tobii eye-tracking technology allows users to hit even the smallest targets on the screen. I-Series devices feature Gaze Interaction with optimized zoom, making selection easier than ever.